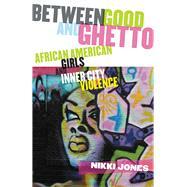 With an outward gaze focused on a better future,Between Good and Ghettoreflects the social world of inner city African American girls and how they manage threats of personal violence.Drawing on personal encounters, traditions of urban ethnography, Black feminist thought, gender studies, and feminist criminology, Nikki Jones gives readers a richly descriptive and compassionate account of how African American girls negotiate schools and neighborhoods governed by the so-called code of the street”—the form of street justice that governs violence in distressed urban areas. She reveals the multiple strategies they use to navigate interpersonal and gender-specific violence and how they reconcile the gendered dilemmas of their adolescence. Illuminating struggles for survival within this group,Between Good and Ghettoencourages others to move African American girls toward the center of discussions of the crisis” in poor, urban neighborhoods. Nikki Jones is an assistant professor in the department of sociology, at the University of California. Santa Barbara.